Later rabbinic commentary on that verse adds detail to God’s instructions to Adam: “Look at My works! How beautiful and praiseworthy they are! And everything I made, I created for you. Be careful [though] that you don’t spoil or destroy my world—because if you spoil it, there is nobody after you to fix it.” (Ecclesiastes Rabbah 7:13). As modern stewards of creation we too must be especially careful not no destroy this earth beyond repair. Jewish tradition emphasizes many additional values speaking to our nation’s need for energy policies that are environmentally responsible and that pay due attention to the public health and safety of both present and future generations. Humankind has a solemn obligation to improve the world for future generations. 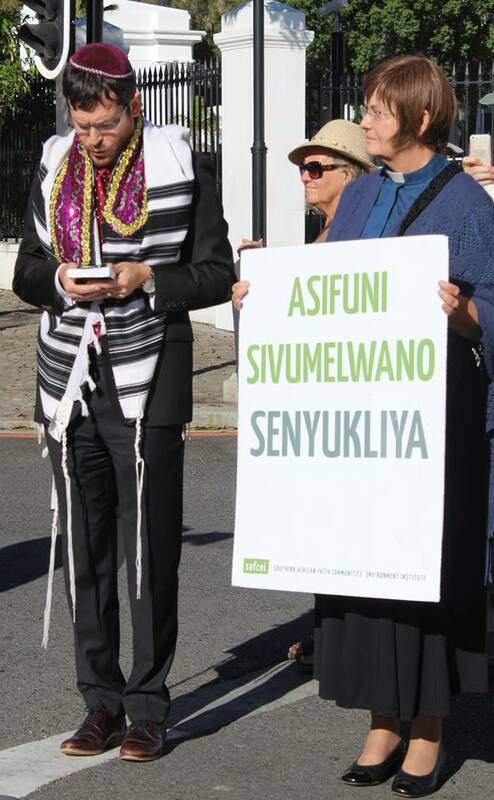 Rabbi Pini Hecht from Cape Town’s Marais Road Shul (left) does a reading at SAFCEI’s multi-faith prayer vigil outside Parliament, 2018.